Husky Haven had a wonderful and surprising adoption last night. One of our little girls.....she's been in the program for at least two years got a fantastic new home!!! Nellie is a mix, part Siberian and part....well we just aren't sure. She is such a sweet girl , and one of the dogs I call a universal playmate....we could literally put her out to play with any other dog and there would never be fights or hassles! !Husky Haven never really got applications for her....so we just figured that she would stay with us forever. Then a woman from Oklahoma chose her last night and she is on her way to her new home. We wish Nellie the very best and are so happy she has found her forever home!!!!!!!! So I have a few new puppie pictures....they turned 9 weeks old yesterday!!!! They are completely adorable....and so much fun to play with every day!! Here's our cute little boy Willy!!!! And last but not least.......our sweet girl Silly!!!! Mom is a pure Siberian....sure don't know what the other half is!!! !We still need to spay/neuter them....hoping to do that soon!! !If you could contribute to that please go to www.huskyhaven.org and donate for their care.....we appreciate any help you can give!!! Hope you enjoy the pics and once again, have a wonderful life Nellie!!!!! So Saturday we went to a rescue show "Celebration for AniMALL Lovers" at San Jacinto Mall in Baytown. Husky Haven doesn't often get out that way, so we thought this would be a good opportunity. We took three fosters that had never been together before, so we were hoping they would behave themselves for the show....our babies were Rock Stars that day!!!! It was a small show...but we talked to a ton of people....it was so fun!!! This is Mallory...my foster. She is a mini-husky, she is 2 1/2 years old and weighs about 38 pounds, that's as big as she will get. She came from animal control, microchipped, heartworm negative and in really great shape. We finally were able to track down her owners after a couple of weeks....but after she ran away, they really didn't care to get her back......I was pretty sad about that, so took her home to play with my three......they all get along great!! This is Kia.....yes, she was named after the car. She was dumped at a Kia dealership on a 6 lane highway at about 6 months old. Luckily, some of our volunteers were on that road and picked her up before she wandered and was hit. She is a sweet little girl.....now about eight months old and will get a little bigger in the next few months. This is Tilton with his foster mom , Becky. He got his name for the reason that, coming out of animal control, he had such a massive ear infection in one ear that his head was constantly tilted. As you can see he's a beautiful boy and , of course, no more ear infection!!!!! You can see that all our babies were having a wonderful time.....I'm sure they would have stayed there forever with so many people loving on them!!!!! !All three of these dogs are up for adoption at www.huskyhaven.org.....and a lot more as well! We thank San Jacinto Mall for having us......for any of you in the Houston area, we will be at Pet Expo on April 14th.....please come and see us!!!!! So over the weekend we had a sweet lady, Robin , adopt one of our puppies. She called her Nanook, and now she is going to be a spoiled girl....she has all new toys,new bed, and a new life....we are so grateful!!! 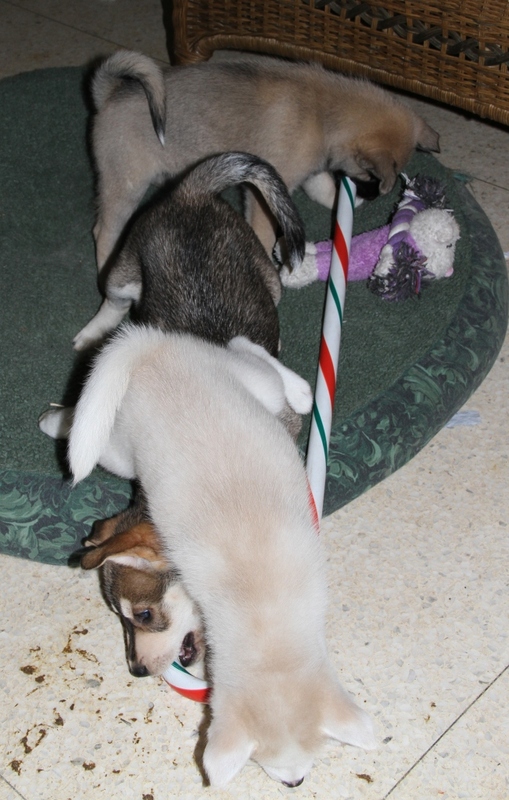 Playing with my siblings...I'm taking that Candy Cane!!! And now the story of Hudson....he and another black and white Husky...that we named Lyric, were brought in about a year and a half ago. They were pretty much soul mates...stayed in the kennels next to each other....and definitely had a bond. 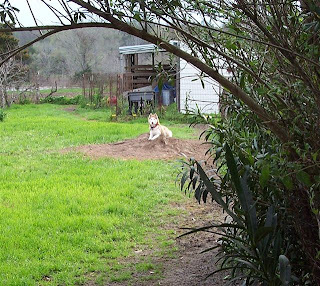 A few months later Lyric was adopted by a wonderful family in Austin...and she still has a great home. Hudson stayed with us and missed his friend. My best buddy Becky lost her sweet dog Huffy last April and was looking for a foster to help her through the transition... she picked Hudson. He is a big , great dog and I hope he helped her. Through the last year we have gotten some applications for Hudson , but nothing ever worked out...till today!!! We got an application that was perfect...a great girl, Vanda, adopted Hudson today!!! I know in many ways Becks will be sad...but she is ready to get her new foster. Hudson and I love you Becky and I hope Vanda loves Hudson as much as you did. Thanks to my friend Cyndii for the new puppy pics. So things have been crazy lately...trying to catch up with posting. 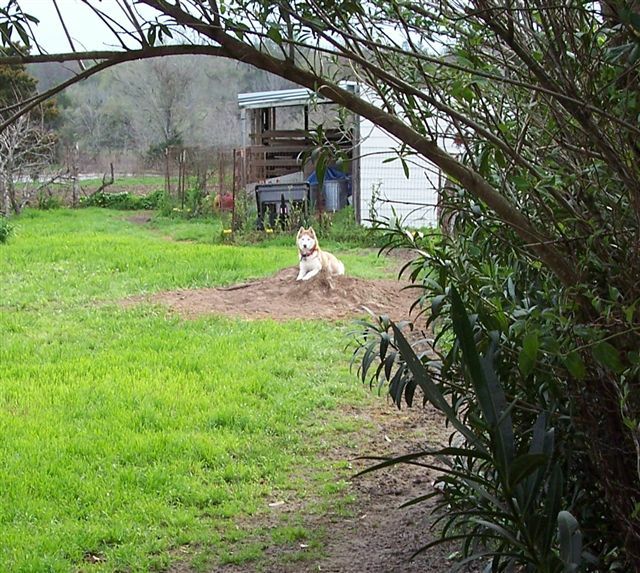 Next weekend we start working our rescue shows all over Houston....lots of work there and I'm trying to work on some fundraising projects...thank goodness I'm retired...Husky Haven is my non-paid full-time job!!!! Wanted to post some pics of Thelka taking her walk yesterday...she seems to be doing well...and we hope these are non-cancerous tumors like they were four years ago. Keeping thinking good thoughts for her and if you want to donate please go to www.huskyhaven.org., we can certainly use the donations for her medical bills. Last Saturday was our monthly work day at the rescue....it had been raining and cold that week and in the morning and I figured we might not have anyone show. I was wrong!!! We had five or six great workers come out and they really got a ton of stuff done that day....a huge thanks to all of them!!!! That afternoon we had a couple come over to look for a dog to replace one of theirs that had just gone to the Rainbow Bridge. They had chosen a couple of our younger girls to look at, but we decided to throw another girl into the mix. Because they had two older dogs....Miss Skye seemed like she might be a better fit. I took Skye out first....and it was love at first sight...not only with the humans but the other dogs too. Looking for her new home!!!!! Skye had been looked at three times this year....every other time someone was gone and she was still here.....not last weekend!!! They are fostering and plan to adopt as soon as they can.....Good luck my sweet girl!!!! We have also had some interest in our puppies and I will update you as soon as I know for sure. 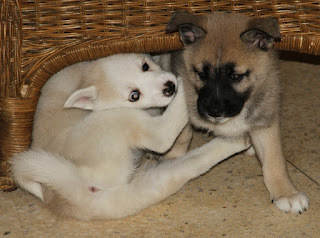 Please go to www.huskyhaven.org and check out our babies or make a donation if you can....all is appreciated. If you are in the Houston area come and see us next Saturday at San Jacinto mall or on April 14th at Pet Expo!!!! So the puppies will be 6 weeks old tomorrow and I wanted to add some videos I've taken over the last couple of weeks. They aren't the greatest, but I promise I will take a better one to post tomorrow when we commemorate their 6 week birthday. In a couple of weeks we will be getting the puppies spay/neutered and up to date with shots. They will be ready for their fosters or new families at that time. I will also be taking a couple of puppies to some shows we will be doing at the end of March...mid April.....I'll fill in the details later. OK, for something a bit sad..after the happy puppy news...I want to talk a little about one of our senior girls, Thelka. Thelka arrived at Husky Haven about the time I started volunteering...a little over four years ago. Her family had turned her in because she had some lumps on her chest and they just didn't want to deal with it...she was 4-5 at the time...great family she had. 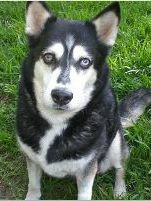 We took her and had the lumps removed and she went on living her happy life at Husky Haven. The younger ones came and went, but Thelka stayed and after a while she was just one of the girls here. In February an application came in that was perfect for Thelka, a couple wanted an older dog as a companion for their senior dog. He had just had a double hip replacement and needed someone calm, she fit the bill. We were excited and that weekend decided to get her pretty for her meet and greet. We were washing her and got to her chest...the tumors were back , and bigger than they had been. We knew that she could not be adopted , we didn't know what was going on. Last week we noticed the tumors were a bit bigger and yesterday she was at the vet for an x-ray. Luckily her lungs were clear , nothing had spread if it was cancer. Thelka went under the knife this afternoon and I will know in the morning how she is and will know after pathology if it was cancer...or a non-cancerous tumor. Keep good thoughts that our girl is going to be alright...she is so sweet. If you can donate for either the puppies or Thelka, please go to www.huskyhaven.org and help us out. We really appreciate anything you can donate to us. I hope you enjoy my dog stories...please continue to keep reading and commenting...I'm going to keep writing. Rudi was one of our wonderful success stories. Last summer we got a call that a young Husky had been dumped in a school parking lot.....and subsequently hit by a car. Husky Haven went to check him out, luckily he was just tapped by the car....but we didn't know if he had broken bones or possibly head trauma. We took him with us and had him checked out. No broken bones....but definitely in major pain. For the next month he howled in pain when we put a harness on him to walk , and he had some major trust issues. I worked with him every day so he would trust me and play with me. At the end of two months we were playing hide and seek every day and he would come to me for petting and loving. I decided in August that I would take Rudi as a foster, he could get socialized with my three dogs and get used to living in a home. Here he is with Lizzy...they look like Mom and son. He's the cutie on the left. Rudi was part of my family for about three months when an application came in that was perfect for him. A family needed a pal for the Husky that they had adopted from us a couple of years ago. Rob and Laura came to meet Rudi at my house and see if he could work out with Martina. They came in first and Rudi was a little scared, but he warmed up to them in no time...but the true test was coming. Martina walked in the backyard and Rudi was ecstatic, he found his new sis. They took Rudi that afternoon and he has had a fantastic home ever since. The most wonderful thing..as a foster, is having his new family send me pics so I can see how he's doing. Please enjoy the pics of Rudi with his new family...and thanks so much Rob and Laura!!! I've been wanting to post this on my Facebook for a long time, but wanted to see if our puppies would be able to make it , so now I'm going to blog about it. Here's the story: Five weeks ago Husky Haven was called to look at an owner turn in Husky. For those of you who don't know, owner turn ins at animal control are usually the first to be put down. When Husky Haven got there, Momma was going into labor and had 6 puppies....all seven of them were slated to be put down that night. 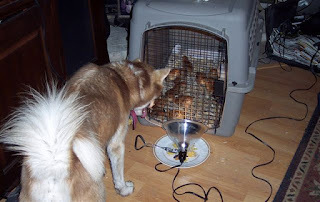 We needed to give those babies a chance, and Momma and the puppies were brought back to Husky Haven. The thing is , when we don't know if the Mom is completely healthy, we are not sure if she can pass on immunity , through her milk, to the puppies. I think we have been lucky, Momma is a great Mom and so far the puppies are doing well. I can show them now because we gave them and their Mom their first distemper shot last night. I have great hope that they will make it to eight weeks , at that point they will be spay/neutered, have their shots and will be ready for foster/adoption. As you know all of this costs Husky Haven money and we could use donations. Please go to huskyhaven.org and donate what you can to their further treatment. If you donate , and say it's for the puppies, all monies will go to them. Please find it in your heart to help them. Until then enjoy the pics I have posted!! !